Springing forth from the punk era of the late 70s, A Certain Ratio carved their own niche by marrying the gloom and gristle of the Manchester's Factory era with a whole load of groove. Hailed universally as pioneers of what became known as ‘punk funk’ thanks to the success of ‘Shack Up’ on both sides of the Atlantic, their sound is not easily pigeon holed and their influence can never be understated. The band introduced the avant-garde elements of funk, jazz, electronics, tape loops and technology to the pop song, wrapping it in a post punk aesthetic, adding great clothes and the coolest haircuts. 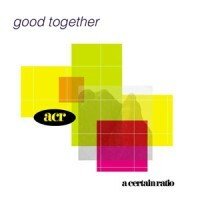 Alive and well and on A&M after the Factory split, A Certain Ratio were in euphoric and emotive form for 1989’s Good Together. Bursting with the boundless positivity of the acid house era, the LP sees ACR divert their usual funk into the baggy sound of the time, exploiting conventional song structures to convey themes of togetherness and hope. Soulful, smooth and packed with proper anthems, including the saucy eyed serenade ‘The Big E’ and the wriggling acid pop of the title track, ‘Good Together’ remains the ACR of choice for ageing ravers everywhere.